“Customer-centric companies are 60% more profitable than companies that are not” (Deloitte Touché). The statement above shows that it is even more profitable to be customer-centric than to be profit oriented. The question is no longer centered on what the benefits of customer-centrism are because they are well established. The question then should now be: what it means to be customer-centric and how a customer-centric culture is created. To be customer-centric means, to make customer-centered considerations the key driver of your service orientation. Customer-centricity is those set of values that create a positive atmosphere for consistently delightful customer experience. It’s a total commitment to creating and sustaining an atmosphere of trust. It’s about knowing that when positive customer experience is sustained over-time, it inspires customer loyalty, higher chances retention, and long-term profitability. Customer-centricity in logistics, for instance, can mean a sheer commitment to delivery requirements of the customer, which may include (among other factors) the safe delivery of goods within a designated timeline due to the time-sensitive nature of the industry. On average, companies lose approximately 10% of its customer base each year (also known as customer churn). In view of these staggering facts, companies that are profit-oriented, with little or no attention to customer needs will have a high churn (customer attrition rate), while companies with firm customer-centric (customer-focused) culture have very high retention rates and the chances of increasing and maintaining higher revenue brackets over a much longer period. Having established the key benefits of customer-centricity, we need to establish some important step in creating a pervasive customer-centric culture in the organization. Establish Relationship Management Values: This is where the executive management defines the key value propositions or customer-centric objectives and assign Key Account Officers to drive these values and consistently justify the reasons the customer chose you in the first place. In other words, creating emotional connections with customers by simply understanding their expectations, ensuring that delivery deadlines consistently beaten within the approved budget limits and keeping clients informed on the real-time status report are key customer-centric values that require the attention of responsible managers. In logistics, this is so important because customers need a single-contact point/person fully authorized to attend to all their needs to address their concerns. Promote teamwork: Internal culture of intra and inter-unit collaborations is the key driver of a customer-centric culture. This is so because internal synergy makes meeting customer service seamless and delivery objectives easier to achieve because everyone understands and demonstrates clear commitment towards the common customer-centric goals of the organization. Given that it is very difficult to promote a customer-centric culture in an organization that lacks team cohesion and sense of commitment to the common interest of the organization are more prone to repeated customer service mistakes and hire churn or customer attrition rates. Obtain regular customer feedback and plan for improvement: Structure your feedback system to obtain daily, weekly, monthly quarterly feedback either through a Customer Relationship Management (CRM) technological platforms/database, online and other conventional media. The key objective must be understanding and analyzing customer behaviors, antecedents, consistency, the pattern of request key requirements and so on in order to improve their overall experience. The absence of a deliberately structured customer feedback system is tantamount to groping in the dark and relying on chance for any meaningful progress. The line between customer-centricity and profit-making must be drawn because it is costlier to focus on immediate profit-making objectives and experience a high customer attrition rate and an insignificant revenue base in the long term. 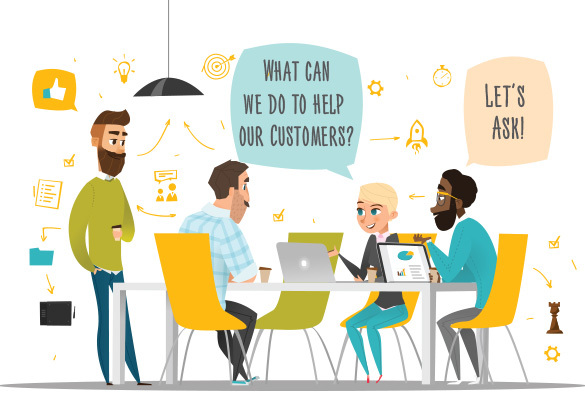 Though establishing a pervasive customer-centric culture requires a huge investment in people and resources; a firm commitment from all and sundry, the long-term gains are enormous and self-sustaining because it guarantees high customer retention rate, larger customer base and consistent growth in revenue.